Handmade all natural cold process soaps made near Sauratown Mountain in Stokes Co which is north east of Winston-Salem, North Carolina. We are proud to be a North Carolina small business which specializes in handmade soap made in small batches. 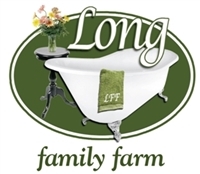 Long Family Farm, LLC has been crafting handmade, all natural, cold process soaps since 1998 in Stokes County, North Carolina which is north east of Winston-Salem. We make a both goat milk and non-goat milk soaps to meet a number of needs. It is the only soap that the Long Family has used since 1999. Sliding Forward in Stokes Co.
At Long Family Farm, LLC, we grate this soap and add 2 cups Borax and 2 cups Washing soda (both available at your local grocery store) to create a powder laundry soap. To make an extra fine powder, put grated soap and a small amount of either the Borax or Washing soda into a food processor (with the blade attachment) and grind the soap to a fine powder. This method will dissolve your soap more quickly in the washing machine. Use about 1/8 of a cup in a regular wash cycle. You may wish to get a second bar to use as a stain remover. Wet clothes and rub the stain with the soap. This soap should NEVER be used on your skin. This soap is designed for laundry use only. Unscented soap is an all natural cold processed soap made from water, coconut oil, olive oil, soybean oil, palm oil, cocoa butter, and sodium hydroxide. ALL Sliding Forward in Stokes Co soaps will be donated to and will benefit our East Stokes Outreach Ministry. Our oldest daughter volunteers at East Stokes Outreach Ministry. Personal care items are in high demand, but rarely donated. We would like to help meet the need in our local county. After a number of years of trying, I finally have a face soap I am willing to put the Long Family Farm label on. This all natural cold process goat milk soap contains 1/3 cocoa butter and 5 other moisturizing oils. Ingredients: Goat Milk, Cocoa butter, Coconut oil, Almond oil, Avocado Oil, Castor oil, Jojoba oil, Wheat germ oil, Beeswax, Sodium Hydroxide, Bergamot and Geranium Essential oils. Choose from our Original FACE soap with no Activated Charcoal OR Charcoal FACE soap which help in detoxifying the skin by clicking on the box labeled FACE. Soap dish by Sue Davis . Almond oil has been known to be especially suitable for eczema, itchy, dry and inflamed skin. Avocado oil is a highly therapeutic oil which is rich in vitamins A, B1, B2, vitamins D and E, protein, pantothenic acid, and fatty acids. Skin problems, especially eczema and psoriasis, respond to its high content of vitamins A and E.
Castor Oil is rich in fatty acids and very moisturizing and lubricating to the skin in general. It acts as a humectant, attracting moisture to the skin. Jojoba oil is very similar in composition to human natural skin oils. It penetrates the skin rapidly to nourish it and also softens and moisturizes mature and dry skin. Jojoba helps to heal inflamed skin conditions such as psoriasis or any form of dermatitis, helps control acne and oily scalps. Wheat germ oil is rich in naturally occurring antioxidants including vitamin E and beta carotene. The essential oils were also picked to leave the face feeling clean, but not dry. Geranium Essential oil is useful for all skin conditions as it balances sebum. Bergamot Essential oil has antiseptic properties that make it ideal for treating acne. February 18, 2019: Our Chill Pill soap is currently out of stock. Lavender Chamomile Goat Milk soap is an all natural cold processed Goat Milk soap made from goat milk, coconut oil, olive oil, soybean oil, palm oil, cocoa butter, Lavender Essential oil, sodium hydroxide, Organic Chamomile Powder. 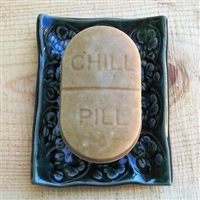 Chill out with our Chill Pill soap. Gardener’s Friend soap contains very fine pumice and is designed to help clean your hands after an afternoon in the garden. This year (2019) we have added jewelweed infused olive oil and lemon balm infused olive oil. This soap contains organic nettle leaf which reportedly helps with the itching of summer plants and bugs. We believe the combination of Extra Fine Pumice, Organic Nettle Leaf, Jewelweed Infused olive oil and Lemon Balm infused olive oil will make this your "go to" soap after your outdoor projects. If you order 1, you will receive 1 of the 4 designs. If you order 4, you will receive 1 of each design. Basket by Pamela Buchanan of VineWorks Lime Bay Rum Allspice Goat Milk soap is an all natural cold processed goat milk soap made from goat milk, coconut oil, olive oil, soybean oil, palm oil, cocoa butter, lime and bay rum essential oils, allspice and sodium hydroxide. We call our Lime Bay Rum Allspice soap, Caribbean! Patchouli & Cassia Goat Milk soap is an all natural cold processed goat milk soap made from goat milk, coconut oil, olive oil, soybean oil, palm oil, cocoa butter, patchouli and cassia essential oils and sodium hydroxide. Soap dish by Barbara Campbell of Wood 'n' Potter Lavender Oatmeal Goat Milk soap is an all natural cold processed GOAT MILK soap, made from goat milk, coconut oil, olive oil, soybean oil, palm oil, cocoa butter, lavender & ylang-ylang essential oils, sodium hydroxide and oatmeal. Soap Dish by Barbara Campbell of Wood N Potter Shaving Soap. Folks have been asking for us to making a shaving soap for awhile. Ingredients: Water, Coconut Oil, Palm Oil, Sodium Hydroxide, Babassu oil, Castor Oil, Avocado oil, comfrey infused olive oil, Cocoa Butter, Ginger/Ylang-ylang/Bay Rum essential oils and Bentonite Clay. Diameter is 3 inches. We will not be offering shaving brushes as this seems to be a very personal preference with the men. In 2005, I created an all natural cold process goat milk soap for my very dry skin; hence, I named it "judith's soap". This soap contains a combination of 1/4 cocoa butter and 5 other moisturizing oils. Ingredients: Goat milk, Coconut oil, Cocoa Butter, Castor Oil, Almond oil, Avocado Oil, Jojoba oil, Wheat germ oil, Beeswax, and Sodium Hydroxide. Castor Oil is rich in fatty acids and very moisturizing and lubricating to the skin in general. It acts as a humectant, attracting moisture to the skin. Castor oil produces a very rich lather. Wheat germ oil is rich in naturally occurring antioxidants including vitamin E and beta carotene. Eucalyptus & Spearmint Exfoliating soap is an all natural cold processed soap made from water, coconut oil, olive oil, soybean oil, palm oil, cocoa butter, eucalyptus & spearmint essential oils, sodium hydroxide and jojoba spheres. This soap uses jojoba spheres to gently exfoliate. Our shampoo bar is now made with goat milk and argan oil! Shampoo and Soap should remove the dirt without stripping away all your natural oils. 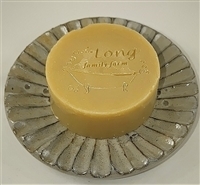 The Long Family Farm Shampoo bar is designed to remove the dirt without removing all of your hair's natural oils. It is a bar and should be used in a similar manner as regular soap. Wet your hair and rub the shampoo bar directly on your hair. When your hair has a lather, rub as you would any shampoo. Rinse when done. Ingredients: Goat Milk, coconut oil, palm oil, castor oil, cocoa butter, wheat germ oil, avocado oil, jojoba oil, argan oil, illipe tree butter, sodium hydroxide, and peppermint and rosemary essential oils. This is the only shampoo judith has used for the past five (5) years. All Things Summer soap is an all natural cold processed soap made from water, coconut oil, olive oil, soybean oil, palm oil, cocoa butter, Lavender, Litsea Cubeba, rosemary, Eucalyptus, Lemongrass, Clove, Geranium, Tea Tree, Citronella essential oils, sodium hydroxide. Essential Oils we use and why we use them. Lavender: This oil might be on every essential oil list no matter the reason. It’s an extremely versatile oil with many components (many of which human noses are unable to smell), including repelling all kinds of bugs. Surprisingly, its fragrance is mild, sweet and floral, but not too intense. It blends well with most other oils, too. Eucalyptus: It’s fresh almost minty scent repels mosquitoes and smells divine. This can also be a go-to for congestion from allergies, improving breathing. Lemongrass: Of the same species as citronella, which is widely used in commercial bug repellents, lemongrass is a bit fruiter and spicier. A personal favorite, lemongrass possesses something that almost screams summer. It’s strong, so a little goes a long way, especially for those biting bugs. Geranium: Ticks don’t like geranium and that’s good news for you. Its floral, fruity scent is reminiscent of an expensive perfume without the chemicals. Dab those seam areas directly where clothes meet skin to prevent ticks from biting. Clove In a 2005 study that compared the repellent activity of 38 different essential oils, researchers discovered that clove oil offered the longest duration of protection against all mosquito species involved in the lab experiments. Citronella Essential oil of citronella contains compounds with high repellent activity, according to a research review published in 2010. Tea tree is not only a green cleaning powerhouse, but it is also an antiparasitic, capable of destroying or suppressing the growth of parasites such as fleas, leeches, lice, and ticks. Use diffusion or direct topical application. Like bergamot, if those nasty critters do make a meal out of you, Australian tea tree can help beat the irritation from bites or stings. Rosemary: Flies and Mosquitoes, both, dislike rosemary. Himalayan (Pink) Salt Soap is an all natural cold processed soap made from Himalayan Salt (FINE grain), water, coconut oil, Avocado Oil, Sodium hydroxide and castor oil. We designed this soap for dry feet or patchy dry spots. Please try this soap on a small part of your skin before using all over. Our NEW Coffee Soap is made with 50%Coffee and 50% Goat Milk and topped with Extra Fine Coffee Grounds. judith loves cream in her coffee, so we added goat milk to our Coffee Soap. Back by popular demand, our orange & clove soap. Usually we keep this soap reserved for the fall season. We have had so many requests for this soap, we are keeping it all year long. Dreamy Vanilla soap is an all natural cold processed soap made from water, coconut oil, olive oil, soybean oil, palm oil, Sodium Hydroxide, cocoa butter, Peru Balsam/Amber essential oils. 10/28/2018 We have removed the ylang-ylang and patchouli essential oils and added more peru balsam essential oil to give our NEW Dreamy Vanilla scent a more true vanilla smell. Our Lemongrass Rosemary Spearmint soap is an all natural cold processed soap made from water, coconut oil, olive oil, soybean oil, palm oil, Sodium Hydroxide, cocoa butter, Lemongrass/Rosemary/Spearmint essential oils, Oatmeal, Aloe and Comfrey Infused Olive Oil. We call this soap "Our Too Much Fun in the Sun" soap. Peppermint soap is an all natural cold processed soap made from water, coconut oil, olive oil, soybean oil, palm oil, cocoa butter, peppermint essential oil and sodium hydroxide. This product contains peppermint oil which should not be used if pregnant or nursing. The soap bar that started our company. Peppermint Soap is the bar that started Long Family Farm, LLC in 1998. It is still one of our favorite bars. Restful Moments soap is an all-natural cold-processed soap made from water, coconut oil, olive oil, soybean oil, palm oil, cocoa butter, Sodium Hydroxide, Lavender/Orange/Frankincense/Amber Essential Oil, Rose Kaolin Clay. 10/28/2018 We LOVE our new look; we hope you will too. We HAVE NOT! changed the scent. Tea tree and Orange soap is an all natural cold processed soap made from water, coconut oil, olive oil, soybean oil, palm oil, cocoa butter, Tea Tree, Blood Orange and Orange essential oils, sodium hydroxide Luffa and activated charcoal. We have been making an activated charcoal FACE soap for a number of year. Folks have been asking us to make an activated charcoal hand and body soap. Here it is! A layer of tea tree and orange soap, pack with ground luffa, is sandwiched between two layers of tea tree and orange soap with activated charcoal. Cleans well and exfoliates at the same time. Peaceful Waters soap is an all-natural cold processed soap made from water, coconut oil, olive oil, soybean oil, palm oil, cocoa butter, Bergamot, Clary Sage, Frankincense, Lavender, Ylang-ylang essential oils, sodium hydroxide, Caribbean Kiss mica. Sandalwood & Grapefruit soap is a cold processed soap made from water, coconut oil, olive oil, soybean oil, palm oil, cocoa butter, Grapefruit Essential and Hawaiian Sandalwood Fragrance oils, sodium hydroxide and Blush Pink & Gold Mica. Lemon Verbena soap is a cold processed soap made from water, coconut oil, olive oil, soybean oil, palm oil, cocoa butter, Winter Ice fragrance oil, sodium hydroxide, ground organic lemon peel, Sunburst Sparkle Mica, jojoba spheres. We also have matching Long Family Farm Bath Treats and a 100% pure soy wax candle. Almond and Vanilla Goat Milk soap is an all natural cold processed GOAT MILK soap, made from coconut oil, goat milk, sodium hydroxide, cocoa butter, almond oil, castor oil, beeswax, Bitter Almond and Peru Balsam Essential Oils, and Almond Meal. This soap contains almond meal which exfoliates gently. judith's goat milk soap - "1958"
Ingredients: Goat milk, Coconut oil, Cocoa Butter, Castor Oil, Almond oil, Avocado Oil, Jojoba oil, Wheat germ oil, Beeswax, Sodium Hydroxide and grapefruit/clary sage/Ylang-ylang essential oils and oatmeal. Would you like to select 5 different bars of soap and save money on the individual bar price? Our Five Bar Special allows you to get any five bars (regular price: $4.50) for $3.75 each. Tell us which soaps you would like in the comments section when you are checking out. Purchasing soap in bulk allows you to purchase 3 pounds and 8 ounces (a batch of soap) of any soap that is in stock at a reduced price from the individual bar price. You may tell us which soaps you would like to select when you are checking out.